Acupuncture is one of the oldest medical procedures in the world and can benefit your general health and well-being. Acupuncture as a practice has been seen in the United States only since the early 1970's but it has been used in Asia for more than 2,000 years. Acupuncture helps your body to help itself. Similar to Western medicine, our body, mind, and spirit function optimally when in a state of balance or homeostasis. Our lives and lifestyle throw us out of balance. 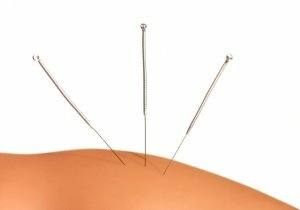 With acupuncture, fine, sterile needles are inserted into specific acupuncture sites along pathways or meridian to balance qi or energy in order to re-establish internal balance. It can be used to treat any sort of pain, whether headache, backache, neck pain, anxiety, stress, or gastrointestinal disorders; acupuncture can even help you quit smoking or lose weight. Acupuncture needles go about 1/4 inch into the skin; they are quite thin, not at all like a traditional needle. There are many theories as to why acupuncture works. Some research suggests that acupuncture stimulates the production of immune-system cells and pain-killing endorphins. Other studies suggest that it alters the release pattern of brain chemicals and hormones. But what we know it does is relax you, and for many problems, like chronic headaches or back and neck pain, relaxation is what is sometimes needed. Acupuncture and Traditional Chinese Medicine are organized systems of medicine that have been practiced in the East for over 3,000 years. Only since 1974 have these practices been used in the United States. Acupuncture is a medical modality based on the concept that the body functions as whole unit with one systemic circulation. This circulation involves blood, body fluids, nerve conduction and energy that move through a network of meridians. When circulation is impaired by anything such as physical trauma, poor diet, tight muscles, intense emotions, lack of exercise, overwork or stress the flow is interrupted and the body manifests symptoms. In the allopathic medical model that equals isolated, individual symptoms that are usually medicated. In the acupuncture medical model that means somewhere the body's natural internal flow is impaired and once the root cause is treated, the symptoms go away. The body heals itself. The primary tools used are acupuncture needles which are as thin as an eyelash, solid, stainless steel, sterile and disposable. The needles trigger the body's natural healing Process which restores Proper circulation of blood, body fluids and energy which in turn relieves the symptoms. In some cases, they are used to trigger the rebuilding of support structures under the skin as in the Face Lift. Here the needles Promote circulation to the face by triggering the Production of collagen which firms and tightens. Cupping is another technique traditionally used for treating respiratory conditions and muscle tightness. More Progressive uses of the cups are massage, lymph drainage and for detoxifying the body. Traditional Chinese Medicine is the art of herbal teas. There are hundreds of herbs in the TCM pharmacy that are carefully and skillfully combined to create personalized prescriptions for each person. Modern applications of this art form bring us the use of the classic, time tested formulas in capsule or tablet form. This allows for great results without the often strong and pungent taste of the tea.